Jude's going through puberty, but some developments have startled him. As his growing pains start to pack a real punch, he begins to reconsider: was his dad telling the truth when he claimed to be a superhero? Until now, he'd always figured those tales of battling corrupt forces after dark were down to one drink too many - especially when the guy stumbled in each morning with whisky souring his breath. Then he took off completely -some hero. Yet now Jude's not so sure. Are these changes standard issue stuff, or a sign of special powers? A pacey, present-tense work of fantasy. In part it is engagingly funny, but there is underlying social commentary addressing the culture of rival gangs bent on marking out their own territories. Timely. 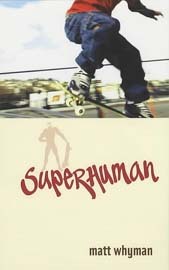 'When I first opened Matt Whyman's novel, Superhuman, I knew it was a book with a difference. It wasn't just his descriptions, but the style. Matt Whyman has a very unique style of writing which I have never before come across in a book. He writes as if he is really there, reviewing what's actually happening and writing about it.